I found the original recipe on the internet and over the course of many years and experimentation have found this to be a great starting recipe. It’s OK to experiment! 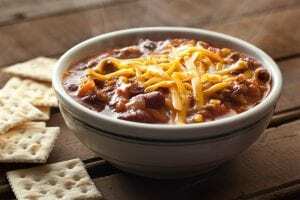 You can make this wonderful chili in a pot on your stove, in a dutch oven, or in your crockpot! And… add extra flavor with red onion, cheese, and cilantro garnish and serve with Dave’s Famous Cornbread! Makes 8 servings. Add the vegetable oil and onions to a dutch oven or other heavy pot. Place over medium-high heat and saute for about 5-minutes to “sweat” and soften the onions. Add the ground beef, and cook for another 10 minutes. As the beef browns use a wooden spoon to break the met into very small pieces. Add the garlic, chili powder, ground cumin, black pepper, chipotle, cayenne, oregano, and sugar. Cook, stirring, for two minutes. Stir in the bell peppers, tomato sauce, tomato paste, and water (or beef stock). Bring to a simmer, reduce heat to medium-low and cook, uncovered, stirring occasionally for 60 minutes. After 60 minutes, stir in the beans and simmer for another 30 minutes. If needed, and more water (or beef stock) anytime during cooking to adjust desired thickness. Taste for salt and pepper, and adjust. Serve hot, garnish with sour cream, grated cheese (I like Mexican 4-cheese blend), red onion, fresh cilantro. Remember…Dave’s Famous Corn Bread! Brown very lean ground beef in vegetable oil in a heavy pan on the stove, remove to the crockpot, reserve the liquid. Put ALL of the vegetables (not tomato sauce/paste) in the pan, “sweat” and soften, add to crockpot. Heat the reserved liquid, add beef stock, tomato sauce/paste, mix in all of the spices and seasonings to make a heavy sauce, and then add to the crockpot. Add beans. Add a couple bay leaves, canned or fresh chopped chilis (hot or mild, your choice). Blend ingredients in the crock pot, cover, cook 4 hours high or 8 hours low (I like low and slow). Use a 50/50 blend of ground pork and ground beef. Instead of canned beans, try soaking dry kidney and pinto beans overnight. Fresh is best! Use fresh chopped poblano or anaheim chilis instead of canned. Jalapeno peppers can add significant heat, be careful! Have fun, experiment with your spices and vegetables. Dave’s Famous Cornbread mix is my favorite. Add a little corn meal for grainy texture and green chilis for flavor.